Fishing line happens to be an integral part of any anglers arsenal. There are a lot of features that play an important role in defining a fishing line characteristics, and that by itself makes it extremely important for angling successfully. Ideally, in order for you to be able to decide on the right fishing line to buy, you should take the conditions, the type of fish, the type of water, the methods you’ll be employing, as well as a host of other considerations into the buying process. However, we realize this is not always practical, we can’t carry half a dozen types of line around with us at all times. So, what do we do instead? We understand the types of fishing lines, what their pros and cons are, and then buy the type that works best for the type of fishing we like to do. Nevertheless, most anglers are confused about the various types of lines that are at their disposal and the specific properties of each type of line for fishing. I completely understand why, as fishing line is probably one of the least glamorous aspects of fishing. We hope that in the next couple of paragraphs, we will be able to help you in gaining an understanding of the pros and cons of the various products so that in future, you will be better equipped to choose the right line that would work in any given scenario. And more than just providing you theoretical information, we would like to help you in catching more fish than you ever did in the past. In the year 1938, DuPont made waves in the industry by discovering nylon, which essentially was a grouping of new synthetic super polymers. These super polymers could be turned into textile fibers which were more elastic and stronger when compared to silk, rayon, cotton or wool. Just one year after that, DuPont started engaging in commercial productions of fishing lines made of nylon monofilaments. This new kind of line, which was very primitive, when compared to the standards set today, did not get popular initially, the older lines used for fishing, particularly the braided ones from Dacron, continued to be popular for the next 20 years. However, in the year 1958, DuPont came up with Stren, which was a much thinner line that had a quality that was more uniform and could be put to use on different reel types, including the newly introduced spincasting and spinning tackle. This line quickly caught on with the fishermen and caused a boom in the field of sportfishing popularity since it helped in making fishing a lot easier. Monofilament products still stay popular even in today’s times, which accounts for more than 2/3rd of all the fishing lines that are sold in the entire country. As is suggested by the name, this product is of single component type. It is created through a process of extrusion in which plastic that is molten is transformed into a strand with the use of a die. The ensuing process is comparatively inexpensive, which produces a product that is less costly. Cost happens to be the most important factor that makes the monofilament line popular at such a wide level. Although that is the case, one should bear in mind that the cheaper brands selling monofilament lines typically do not pay that much attention in terms of quality control, additives and the attention to the process of finishing that is received by the lines of premium grade. As a direct result of this, they are not able to offer the same limpness, tensile strength, abrasion resistance and strength of the knot characteristics that are typically offered by the more expensive monofilament lines for fishing. Said in another way, you are going to get what you are going to pay for. The cheaper off-brand monofilament fishing lines typically do not perform the same as the name brands, so be aware of this as a buyer. If you do end up deciding to go with the use of monofilaments, you should be testing a few of the name brands and decide on sticking with the ones that you find satisfactory and trustworthy. I really like the Berkley Trilene linked above. Here are the kind of baits that you can use while fishing with monofilament fishing lines. Before the nylon was discovered, braided Dacron used to be the favorite fishing line. Dacron was let down be poor knot strength, low resistance to abrasion and very little stretch, so it gradually dies out once the superior monofilaments made out of nylon that was later introduced. As of today, the braided line maintains an interest in small markets, but they still do have their uses. Additionally, they are much improved over the lines from decades past. 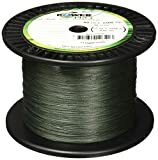 During the early years of the 1990s, aramid fibers and gel spun fibers, with the likes of Dyneema, Kevlar, and Spectra, made an entry into the market of fishing lines, which resulted in the creation of a new classification of lines that were braided called microfilaments or superlines. These newly created synthetic fibers were thin and amazingly tough (even more than ten times stronger when compared to steel). These individual strands of fiber are connected together using a time-consuming process of braiding which results in the production of super strong, ultrathin, sensitive and very expensive lines. The anglers who ran experiments with the superlines that were initially created were initially frustrated by poor knot strength and color options. The existence of so many disadvantages easily outweighed the benefits of micro diameter, ultra-sensitivity, and strength, given the high prices of these fishing lines. The manufacturers of superlines have been making continuous improvements and advances to the fibers that are used as raw material and the processes that are used in converting them into lines for fishing. Castability, strength, and coloration have all been through significant improvements which have overcome some of the early disadvantages of these lines. Experiments have shown that lure responsiveness and movements tend to be superior with braided lines. Additionally, because they have a smaller diameter, superlines are less visible than monofilaments to fish, and the anglers are able to spool more of the line onto their reels; which is a huge advantage for fishermen who are into fishing deep waters. Superlines have a very little stretch, which transmits strikes to the tip of the rod in an instant, which in turn provides for more positive sets of hooks. Superlines also help you in casting further, which makes them the right choice for anglers that are shore bound. Low stretch and higher break strength mean tackling and muscling larger fish becomes an easier task. If you’re into surf fishing, fishing from a boat at sea or from docks, then braided lines offer many advantages over the other line types. Anglers will often use braided lines with either a monofilament or fluorocarbon leader, which allows removes many of the disadvantages associated with braided lines. In fact, it’s how I would recommend using braided lines. Many anglers have a preference for the braid softness to allow for vertical trolling and jigging. If you want to improve the strength of any braided knots, then a small drop of superglue can work wonders. Pro tip: make sure to not overfill reels with braided line. Overfilling will end up in the creation of loose strands during a cast and can cause massively annoying tangles. Just fill them to the extent of 1/8th of an inch from the rim of the spool. Fluorocarbon happens to be a polymer that is nearly invisible when it comes to water since it acts as a refractor for light. In addition to this, it is inert as well, so it is able to resist any deterioration that can be caused by gasoline, sunlight, insect repellents and battery acid. Fluorocarbon also does not absorb any water. The leaders for fluorocarbon were first developed in Japan, where the anglers seem to be very particular when it comes to presentations of bait. The use of fluorocarbons has become very popular in the United States. A lot of us began to use fluorocarbon leaders, particularly in fly fishing and saltwater applications, due to it not being visible under water. As more anglers reported increased success by using fluorocarbons, their sales have really increased drastically. The original leaders made out of fluorocarbons used to be very stiff and very expensive. However, with the advent of new technologies of producing them, they have become much affordable in prices and also more flexible. Fluorocarbons certainly do offer a lot of advantages in situations like clear water where the fish are under a lot of pressure and are slow in biting. Given that fluorocarbons do not absorb any water, it does not get weaker or increase in size due to stretching, as is the case with fishing lines that are braided. The increased density makes fluorocarbons very resistant to abrasion, so they are an excellent choice for conditions that are rough, and this allows it to sink at a faster pace than any other type of lines for fishing. Lures will dive faster and deeper. Fluorocarbon lines stretch to a lesser extent and are slower than nylon. Fluorocarbons, just like superlines, need special care. The best knot to use for this kind of line is the Trilene. Care should be taken to perform at least five wraps when you are in the process of tying the knot; you should also wet the fishing line before you clinch the knot to prevent the line from weakening. You should make it a habit to always check the knot prior to fishing since the knot happens to be the weakest link in your entire line. Fluorocarbons are definitely stiffer when compared to nylon when they are in use. This means that you have to pay more attention to the line in the process of casting. Heavier fluorocarbon lines are made for use with heavier rods, bigger lures, and stronger reels. Fishing lines will not last you forever, and that is the reason why you should always store them properly. Heat is known to have adverse effects on fishing lines, but studies have also shown that light causes a lot more damage resulting in the breaking down of the fishing line in question. If it is not too hard to do, you should try storing all the fishing lines in dark and cool places. If you ask us, the ideal place to store the fishing lines is in a closet in the interior parts of your house. This will end up prolonging the life of the fishing line and keeping it like new. There is no one kind of line that will work perfectly well under all sorts of conditions for fishing. In order to pick out the ideal line, anglers need to take into consideration the species and the size of the fish that they are targeting, type of water and other conditions, the tackle type that they will be using, and scores of other criteria. Nevertheless, in today’s times, with so many different types of lines available, it is very important that you devote some good amount of time in studying each fishing line and the characteristics associated with it so that you will be ready with the best match for each type of situation for fishing. By taking these steps, you will drastically improve the rate of your catches. And the reality remains that after all, catching more fish is what we are all after. Considering the size of the fishing line is also a very important part of picking the ideal line for fishing to purchase. Length and diameter are the main elements that need to be considered when it comes to the size of the finishing line. Manufacturers use pounds as the measure for depicting the diameter of the fishing line, the more the number of pounds, the thicker the fishing line would be. If you are going to be angling for bigger fish sizes, you would definitely want to have a thicker fishing line. You would also want to ensure that you are using the right length for your fishing line. Just think about the depth of water at which you are most likely to find your target fish. You will need to make sure that you have the fishing line that is more than the length required for you to be able to get the bait to those depths. Picking out the right color of the fishing line is the final step in the determination of what fishing line you should buy. The color choices that you have are moss green, gold, blue fluorescent and clear to name just a few. Clear makes up for a very good choice if you are into ice fishing as it blends very well in the icy surface of the water. It also functions very well in clear waters. The best choice of color for fishing in sunny conditions is blue fluorescent. You will be able to see the sun reflecting off the line on the surface of the water, but the fish will not be able to detect any reflection on the fishing line. Gold helps you in seeing your fishing line in conditions of low lighting. Moss green will mask your finishing line well enough if you go fishing in waters that have an abundance of vegetation. The best of the setups for a fishing line is to make use of a leader – which is a shorter length fishing line that can be attached to the primary fishing line at one of the ends, and the lure or the hook can be attached to the other end. It is possible to get leaders that are made of various materials that may be different from the primary fishing line, or they could simply be a heavier and thicker version of the primary fishing line if, for instance, increased resistance to abrasion is needed. Leaders help you in improving your success rates in hooking and keeping on to the fish without you having to retrieve and cast a fishing line that may be made of a much heavier and bigger material. This especially comes in very handy when you are making use of a wire leader. The most key aspect of all types of fishing lines does not involve the line sizes of the fishing lines. It happens to be the breaking strength of the fishing line: this refers to the quantity of force that the fishing line can sustain before it breaks down. This is measured in terms of pound test. This means that a 10 pound tested fishing line can hold 10 pounds before it will break and a 30-pound test will hold 30 pounds and such. There are many things that can lead to the weakening of a line, which also includes the knots that you have tied in it. It is also of extreme importance to pick a fishing line that has the strength to cater to your needs with enough margin for working error. You should be working under the assumption that even a brand new fishing line will not provide more than 80% of the strength it has been rated for once you have tied a lure or a hook to it. The earlier fishing lines used to be natural materials like silk that were braided and were therefore very expensive. The modern-day fishing lines are made of synthetic materials, for example, Dacron, nylon, fluorocarbon, and Dyneema. By a way of wrapping up the article, when you start reading up on this topic or speaking to the professionals at stores, you will find that there is a sea worth of information available on types of fishing line and the best conditions. Your job will be to match the fishing line with the bait of other types such as swim baits that are heavier, buzz baits, work baits, and jerk baits, with the recommendation that fluorocarbon is used in most categories.